Welcome To Our Dogs' House! Yes, once you are owned by a Bullie, you will understand. 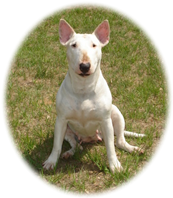 We have belonged to English Bull Terriers since 1999. They are loving, active, demanding, playful and have a grand sense of humor. They require attention and supervision and are not the perfect dog for every person. Bullies have been described as "a three-year-old child in a dog suit," so think on that one for a while to get the full effect.